I met Rob St. Martin at the Canadian National Steampunk Exhibition in Toronto this past Spring. We were on two different panels together, and his commentary on secondary worldbuilding got me intrigued to read some of his steampunk. 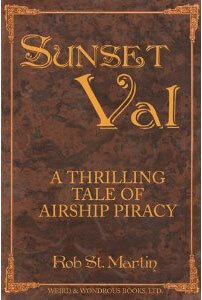 Rob's written a number of books, most for Sabledrake Enterprises, but the book Rob sent me to review, Sunset Val: A Thrilling Tale of Airship Piracy was published through Weird and Wondrous books. Both are small press, so it's unlikely you'll find Rob's books at the local Chapters, which is too bad, because, as I tweeted back in May I thoroughly enjoyed Sunset Val as a fun crosshatch fantasy with a steampunk flavor, targeted at the YA or Young at Heart market. I used the term crosshatch somewhat incorrectly in that tweet, as the Encyclopedia of Fantasy defines crosshatch fantasies as those where the demarcation line between worlds isn't clearcut, "and two or more worlds may simultaneously inhabit the same territory" (237). That's what I get for not checking my sources. But I think the word itself conveys what I was trying to say, which is that Sunset Val is a crossover tale, a tale of portals, like The Lion the Witch and the Wardrobe or Abarat. Calling a novel a crossover fantasy would be terribly confusing, in this world of hybridized genres, sub-genres, and sub-sub-genres. I should have said "portal-fantasy," but that sounds clunky. 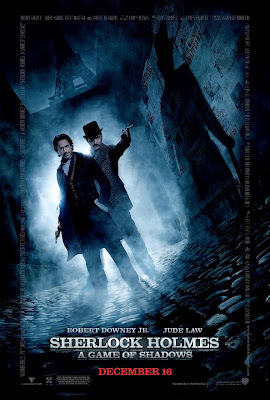 Steampunk doesn't often use portals as a trope - usually all the characters are from this world. Exceptions to this convention seem to come from writers outside the SFF genre, such as Katie MacAlister's Steamed, or Nathalie Gray's Full Steam Ahead. The portal approach works well for writers seeking to introduce non-aficianados of steampunk to the aesthetic: the focalizing character provides a commentary that is familiar, to help situate the unfamiliar. The book begins in our world: Valerie Ventura is an oddball kid who goes in for fencing lessons and goth fashion who finds herself summarily yanked through a portal generated by electricity by the evil Dr. Sweetwater. It sounds terribly contrived and cliched, and when seen in summary, it certainly is. However, what makes Sunset Val a treat to read is Valerie's (Val's) character voice. She's smart, creative, and thankfully, something of a geek. When she is asked by Dr. Sweetwater if she's ever heard of alternate worlds, Val replies, "Only in like, a hundred thousand movies and books" (17). As fantastic genres become more mainstream, it can only follow that fictional characters will have to stop responding in ignorance to such questions. Let's face it: we all know what a lightsaber, a blaster, warp drives, and time machines are - so while it might remain somewhat more literary for characters to be dumbfounded by the appearance of the undead on their block, many North Americans know more about what to do in case of a zombie invasion than they do if someone is choking in a restaurant. Val is largely unsurprised by her situation, and given the character voice St. Martin has written her in since page one, we aren't surprised by her unflappable response. Val's ironic first-person character voice transforms moments that would be clunky in third-person into opportunities for witty humor. Even when he's resorting to canned exposition, St. Martin is clever enough to deliver it via Dr. Sweetwater, thereby rendering it an out-of-control mad-scientist's monologue from Val's point-of-view. The plot follows Val's adventures as she collects the steampunk equivalent of Charlie's Angels crossed with the Power Puff Girls. St. Martin has definitely embraced the girl-power aspect of steampunk, where a woman can grab a sword or flintlock and be the protagonist of a high-flying adventure. 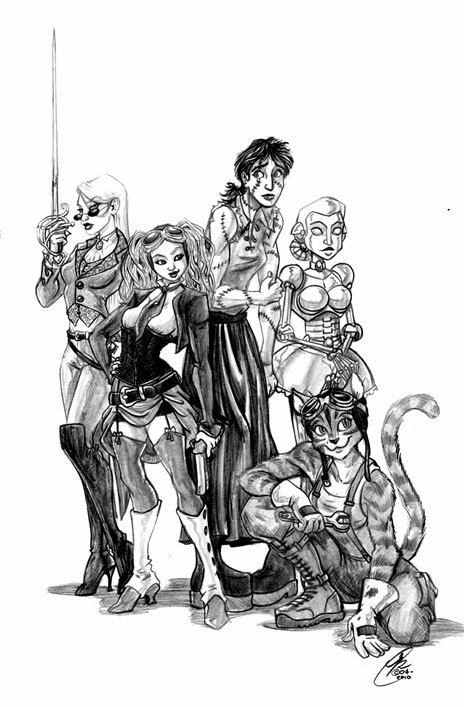 Along the way, Val meets Eve, a patchwork girl ala Frankenstein's monster; Serena Heartlace, a vampire, whose Slavic accent keeps turning our heroine into "Sunset Wal"; an animal-cat hybrid ala Moreau with a French accent named Meliora Fantastico Lyon, a.k.a. "Gigi"; and Argenta, an "automaidon". What was interesting to me was that these secondary characters were the ones who wanted a revenge, while Sunset Val, whose name is repeatedly commented upon as odd or notable, doesn't have the usual issues a young adult character does. She is not seeking a dead parent, or railing against a bad one: she's just a somewhat odd teenager who doesn't get along with her teacher. By the end of the book, a transformation has occurred, but it hasn't solved her drug problem (because she didn't have one) or mended her broken heart (because she wasn't chasing any sparkly boys). In short, Val is a pretty well-adjusted main character who finds herself in an alternate world. The crises are plot-based, not character-based, though there are definitely moments of character. The crises of character are related more to Val's band of heroines, especially Eve, whose loyalty to her "father," Dr. Sweetwater, proves especially problematic. Some brilliant interior art from Sunset Val by Karine Charlebois. I hope we'll see more from Karine in future volumes! I'd love to have coloured this image, but I simply didn't have the time this week - perhaps in the future! 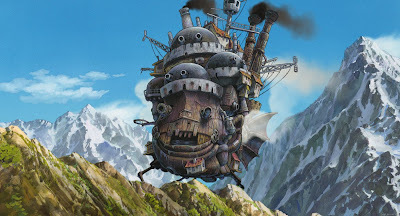 It is this character stability, of a girl "from a world without institutionalized slavery, without airships, where women were able to vote" (172), that permits Val to, as Serena says, bring change wherever she goes. Like her chosen name, the sunset is a time of change, and that is what Val brings to this secondary world of steam. You might say she's the punk in St. Martin's steampunk. Again, Val does not choose to go through - she is forced. But it is her ensuing choices in St. Martin's steampunk earth that has her fulfilling her tests -- Val is a sort of Messianic figure, but not in a destined sort of way. There are no fulfilled prophecies here: rather, it is a process of becoming by virtue of individual choice that determines Val's position by the conclusion. Despite such high-minded analysis, Sunset Val won't go winning any literary awards. It lacks that Governor General's feel, that literary hauteur. I don't think St. Martin was shooting for such an award with Sunset Val, though. I think he was looking to write a fun adventure tale, and in this, he succeeded. This book excels at fantasy-as-wish-fulfillment, providing the sort of grand escapist yarn we yearn for to take us away from the daily drudgery. I'm glad to announce that the sequel came out on Canada Day, making both Sunset Val and Sunset Val Flies Again obvious choices for this year's Canuck Steampunk series, even if Rob St. Martin wasn't from Quebec. Rob recently reported that we can expect a lot more of Val's adventures, as he plans for five books in total. If you find Sunset Val to your liking, you can check out more of Rob's steampunk writing in Princess Smith and the Clockwork Knight.